If you are looking for some tutorials about Microsoft Lync Server 2010, you can check those Jump Start video series. You can find them on TechNet website. It’s about 18 videos discussing Microsoft Lync 2010 deploying, configuring, monitoring and managing. Every video takes about 1h. Deploying Lync Jump Start (10): Compliance and Archiving with Microsoft Lync Server 2010 – Archiving Features, Archiving Policies, Implementing Archiving, and Using Archiving Data. 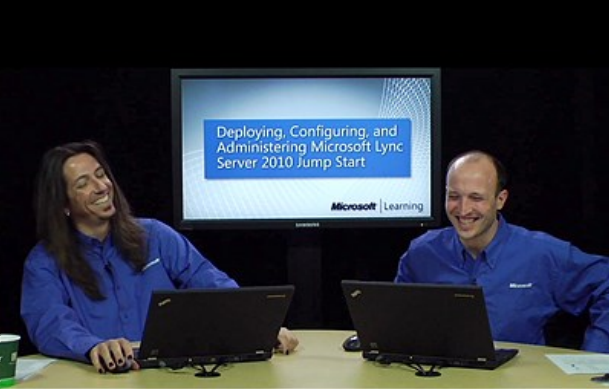 Deploying Lync Jump Start (11): High Availability and Disaster Recovery in Microsoft Lync Server 2010 – Defining HA, Components of HA, Voice Resiliency, BCP Backup and restore tools, Exporting BCP configuration to import later, and Failover scenarios such as Long term restoration of service during a failure. Tagged Jump Start, Lync 2010, Lync Server 2010 Jump Start free online video, Training, video. Bookmark the permalink.